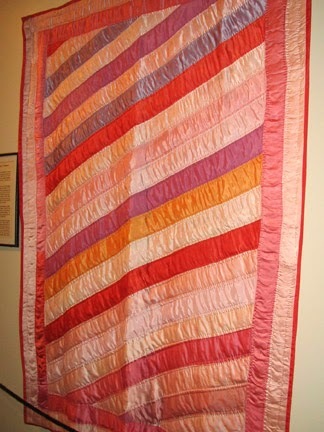 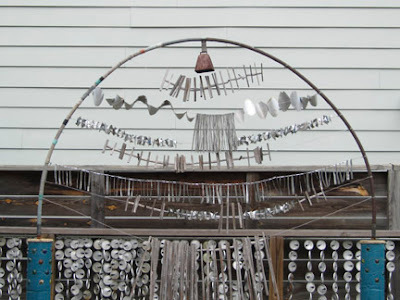 In 1968 when John Milkovisch retired from the railroad as an upholsterer, he started tinkering in his workshop. 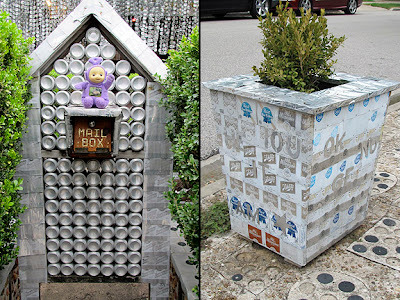 It turned into a project that continued the rest of his life…transforming his ordinary bungalow and garden into a wonderland. 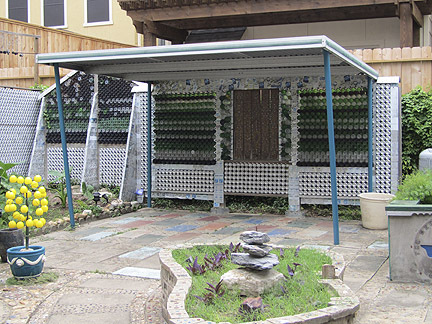 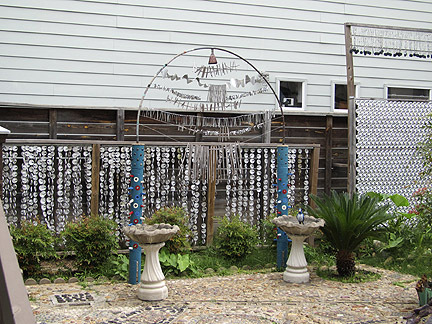 He began using intricate patterns of concrete studded with marbles, salvaged industrial washers, and stones…covering the entire yard and drive. 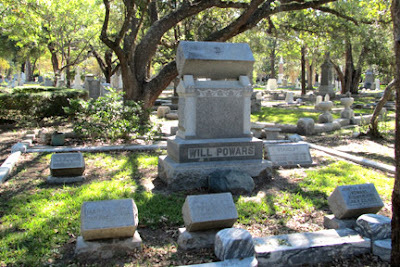 When asked why, he responded simply that he no longer wanted to mow the grass. 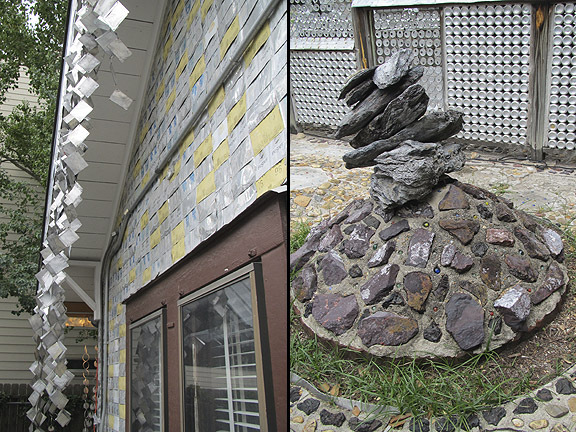 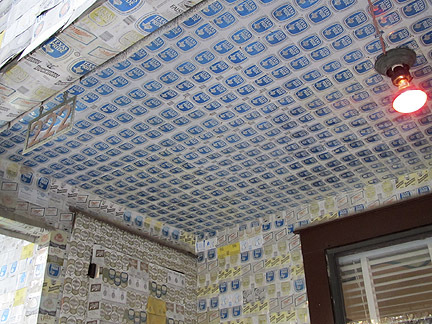 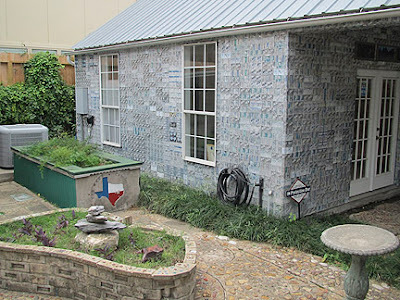 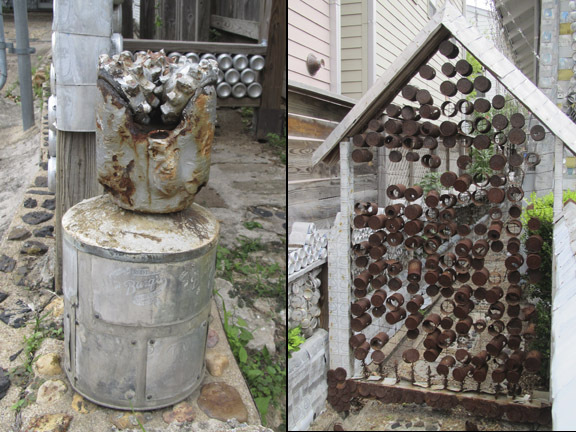 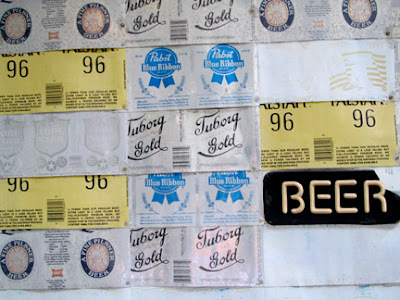 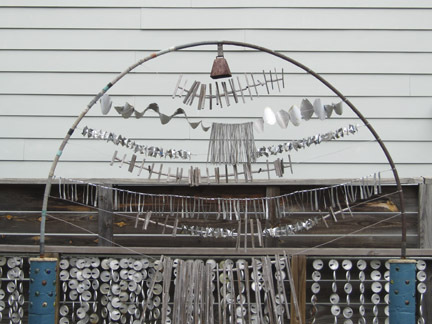 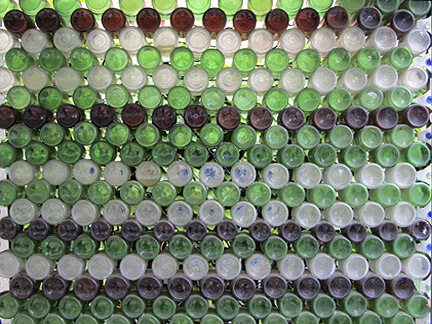 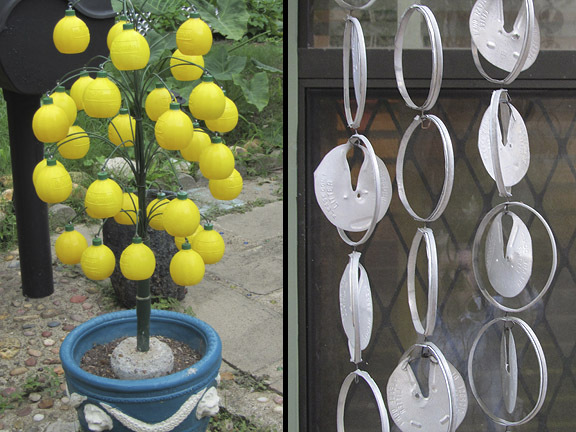 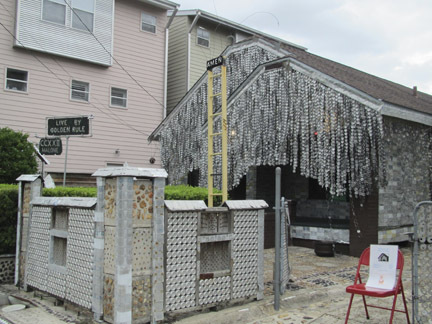 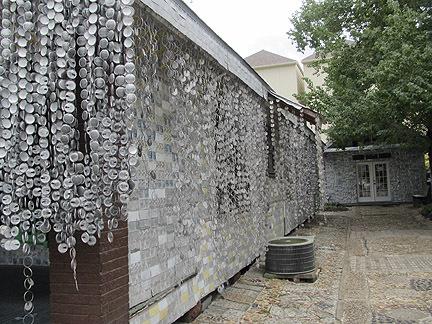 Then he started on the house, first embellishing it with garlands made from beer can tops, rims and pull tabs hung in a dense row from the eaves in the front of the house…eventually around the entire house. 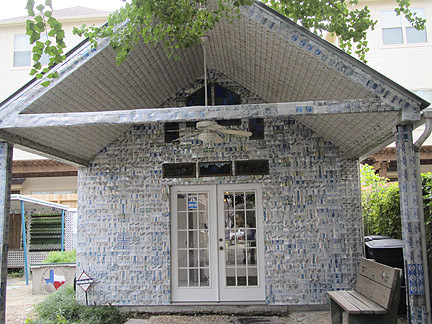 He cut and flattened some beer cans and created a band around the bottom of the house near the back door. 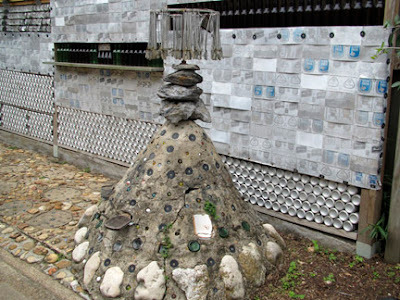 His wife would return from work each day and find a little more of the house had disappeared under an ever growing skin of beer cans. 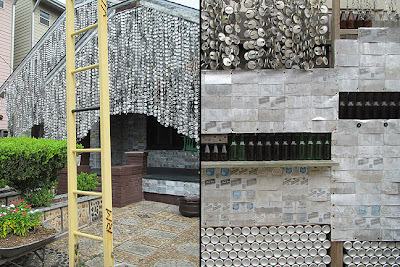 Eventually the entire dwelling was hidden beneath thousands of beer cans, ensuring that he would never have to paint the house again. The cans also created a protective and energy-efficient covering that lowered the family’s electric bills. 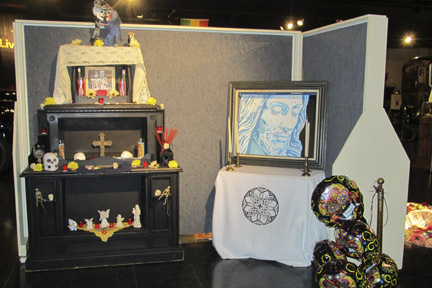 He denied any artistic intent. Today it is owned by the Orange Show Center for Visionary Art and is open to the Public on Saturday and Sunday from noon to 5:00 PM . Roadside America called it Mount Rush Hour, which is most appropriate as it is located on a dead-end street next to the Freeway. 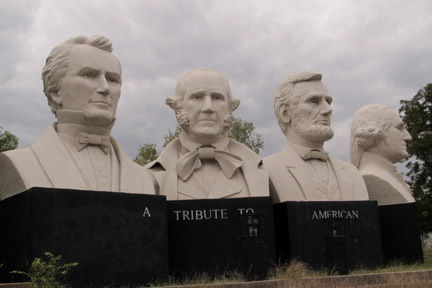 20 feet high busts of George Washington, Abraham Lincoln, Sam Houston and Stephen Austin at the intersection of Interstate 45 and Interstate 10 near downtown Houston, TX. 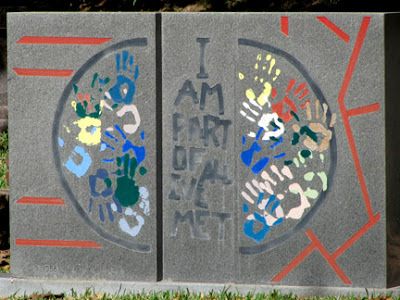 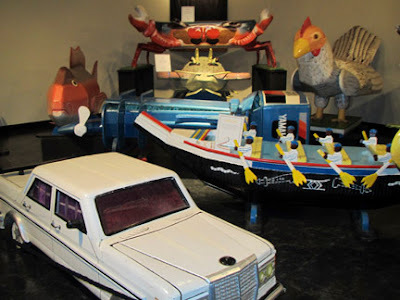 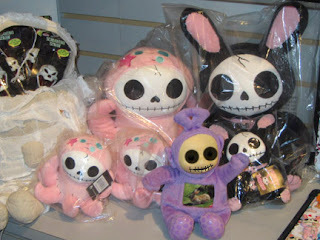 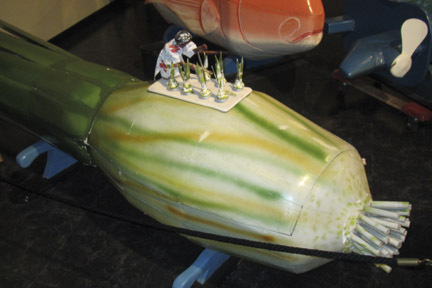 They were created by Texas artist David Adickes who has done several larger-than-life sculptures. 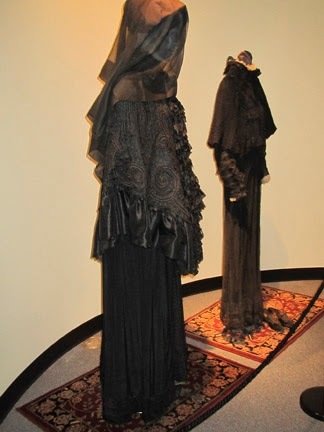 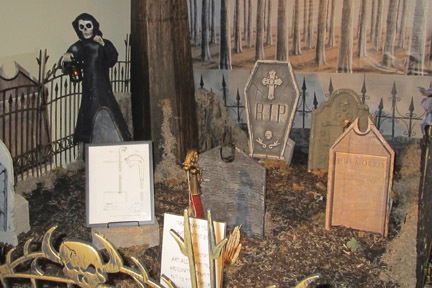 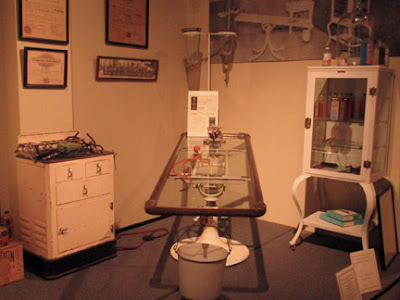 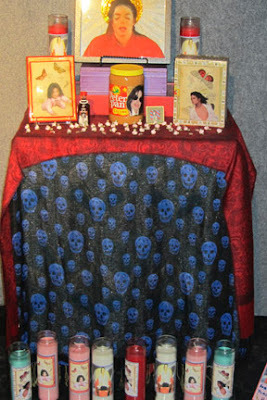 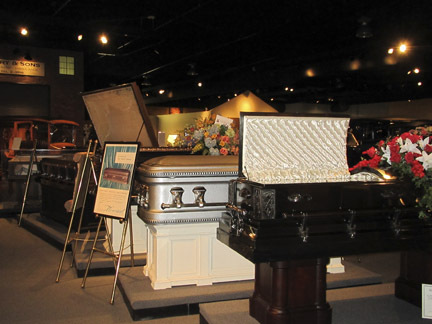 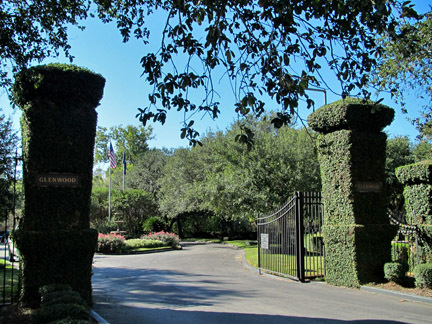 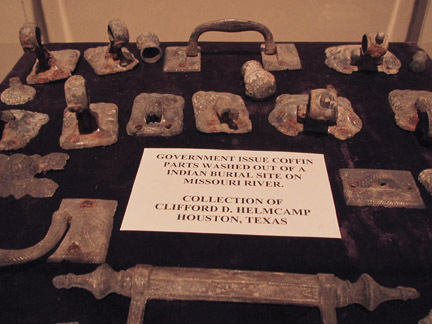 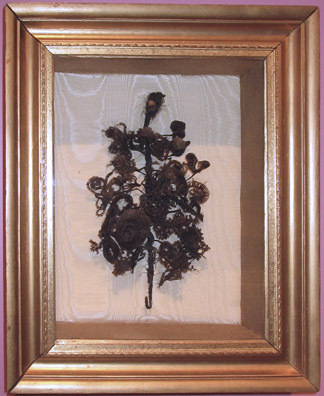 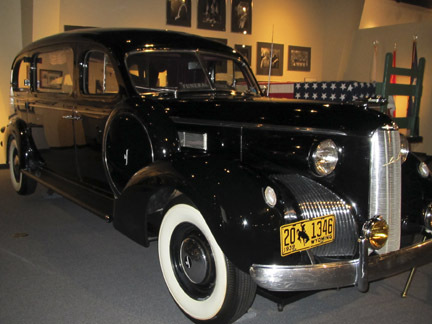 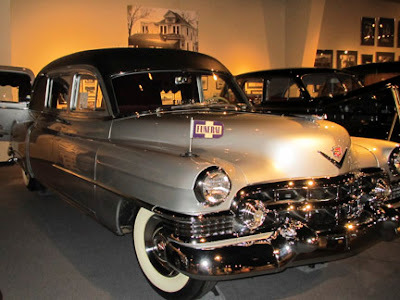 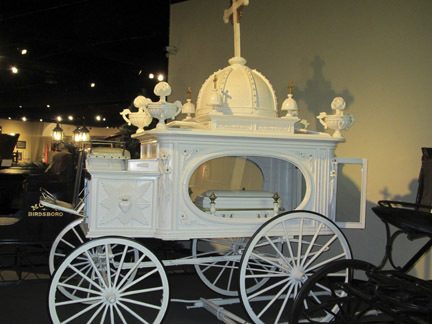 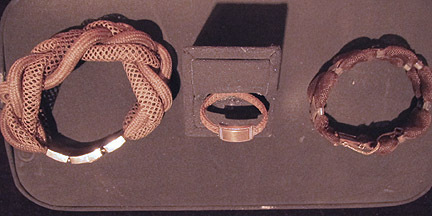 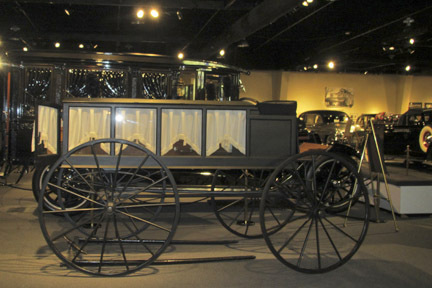 ﻿This Houston museum houses the country’s largest collection of funeral service artifacts. When I was here in 1994 it was slightly rustic and a third the size of today’s very polished presentation. 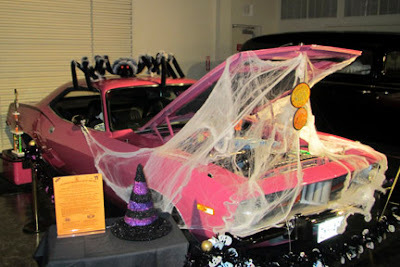 There are many cars…all of them hearses. 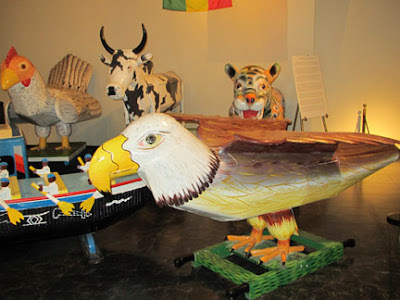 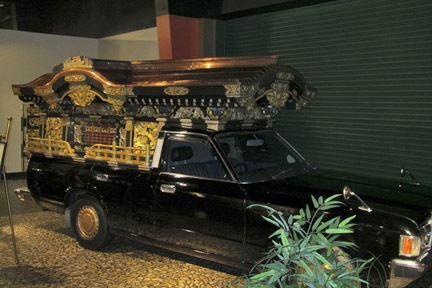 This hand-carved body is composed of six types of wood. 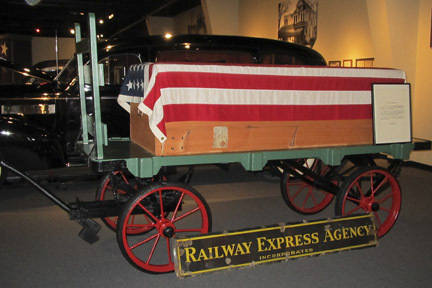 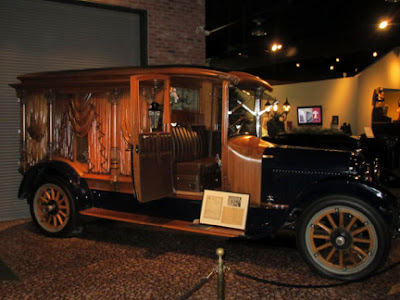 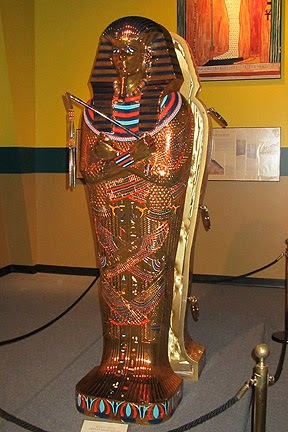 In 1994, they had several coffins, caskets, historical hearses, and the history of embalming, but now they have several more exhibits including: Presidential Funerals, Celebrating the Lives and Deaths of the Popes, Egyptian Funeral Practices, Tomb of the Unknown Soldier, Japanese Funerals, Day of the Dead and 19th Century Mourning Customs. 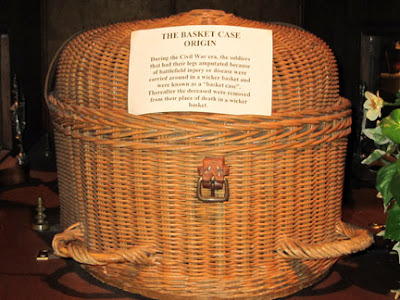 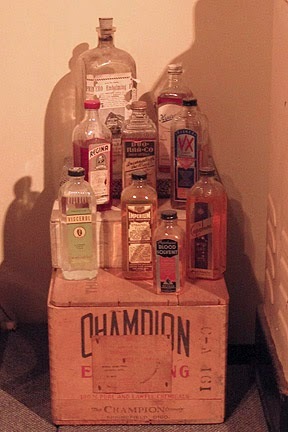 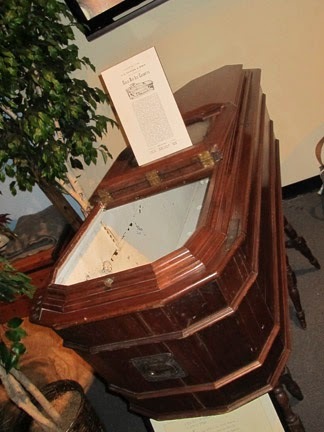 Sign reads: The Basket Case Orgin – During the Civil War era, the soldiers that had their legs amputated because of battle field injury or disease were carried around in a wicker basket and were know as a “basket cate”. 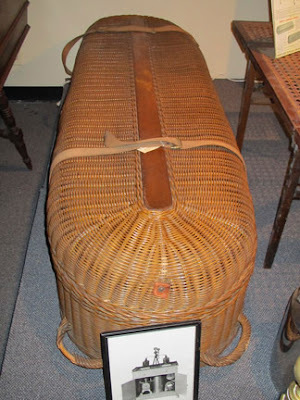 Thereafter the deceased were removed from their place of death in a wicker basket. 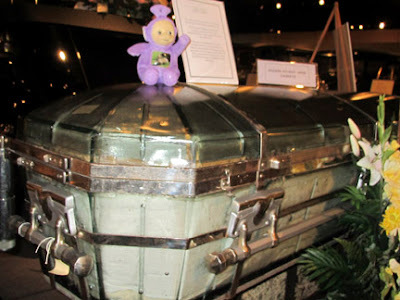 I warned Tinky Winky about playing with plastic bags. 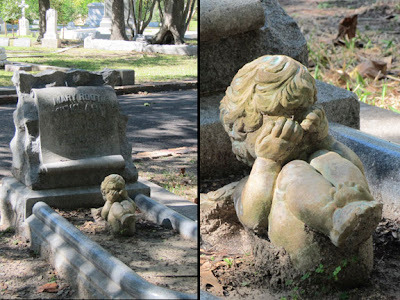 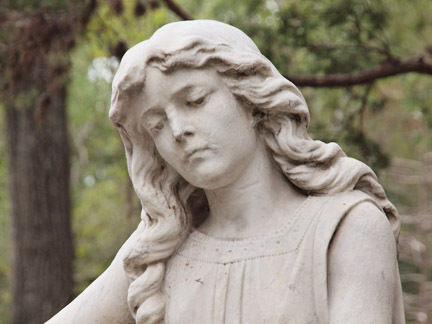 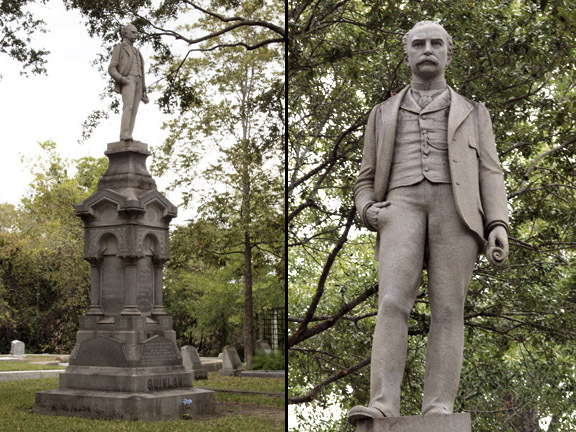 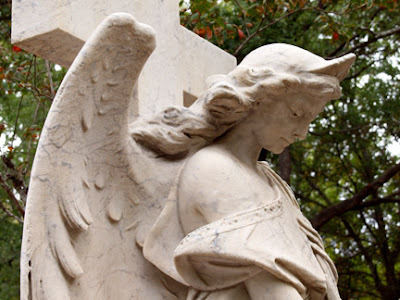 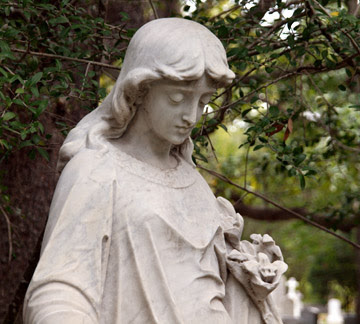 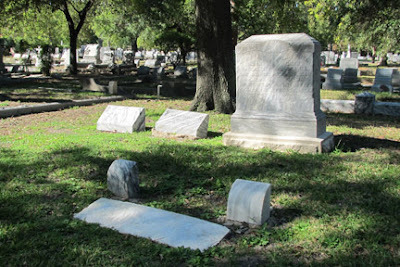 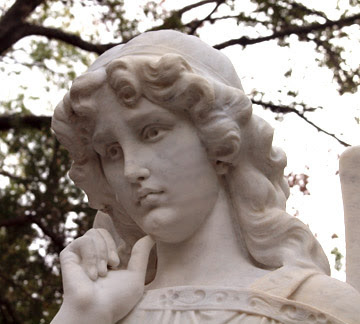 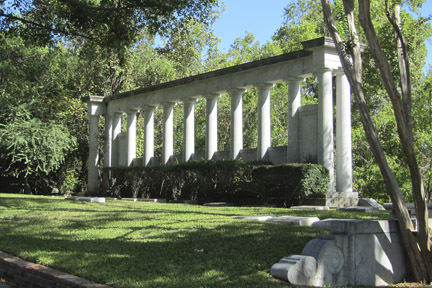 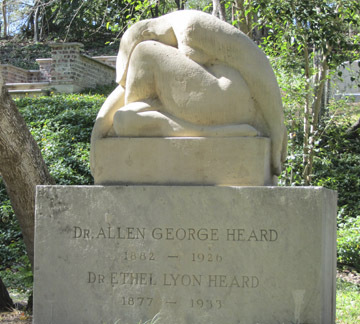 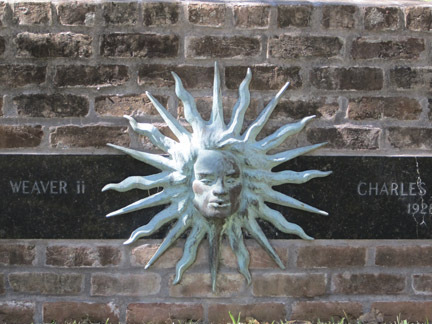 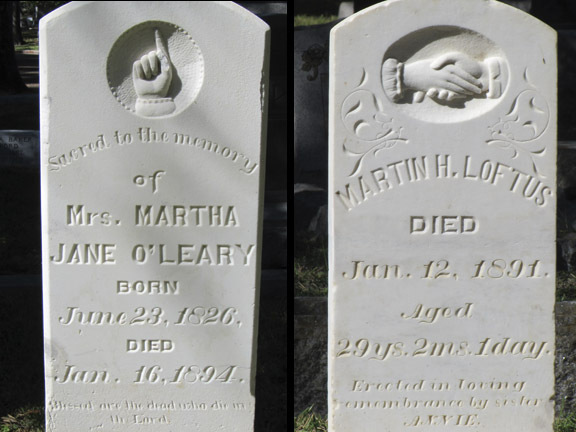 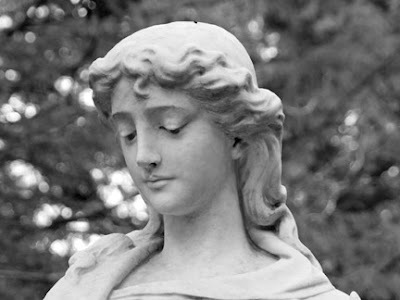 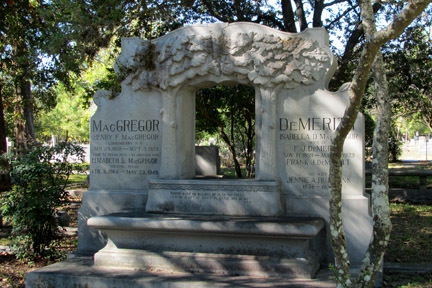 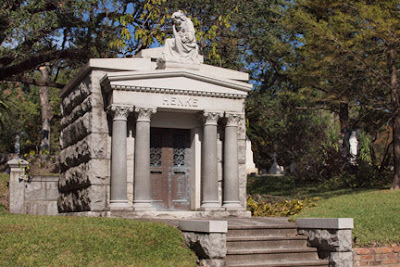 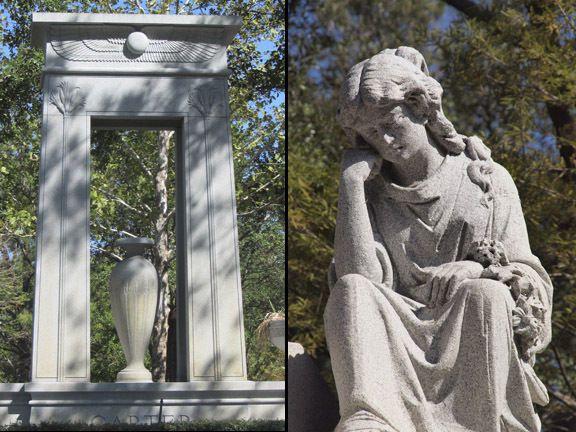 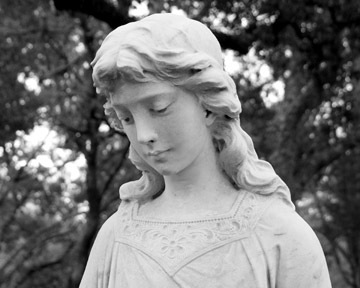 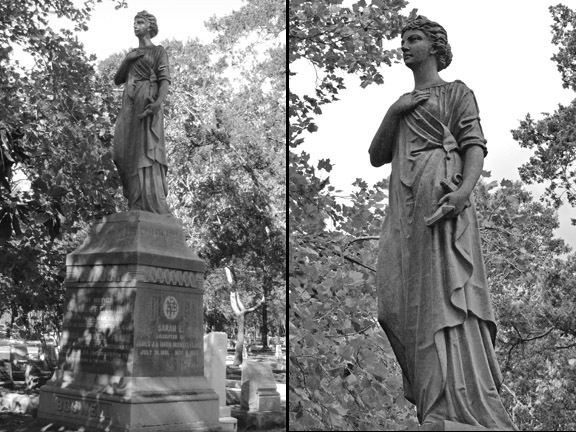 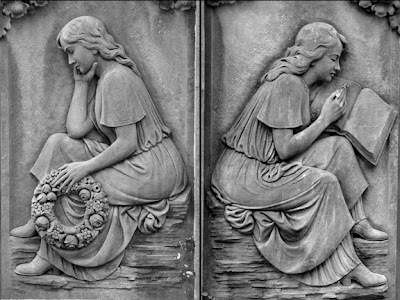 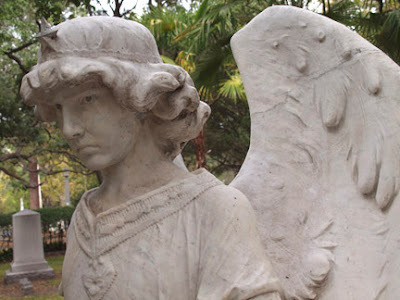 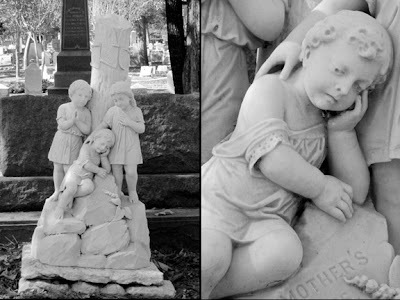 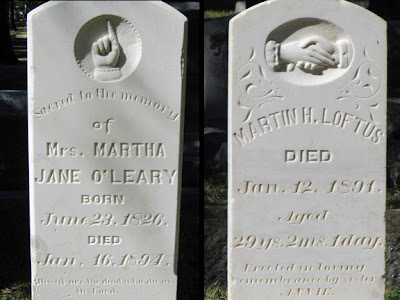 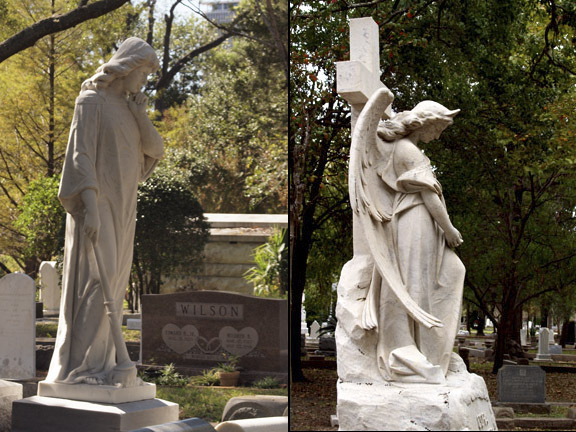 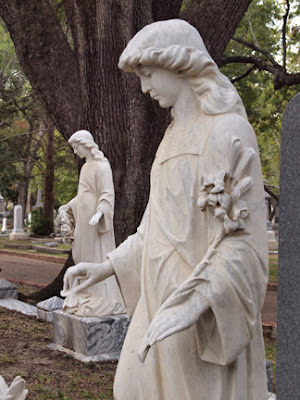 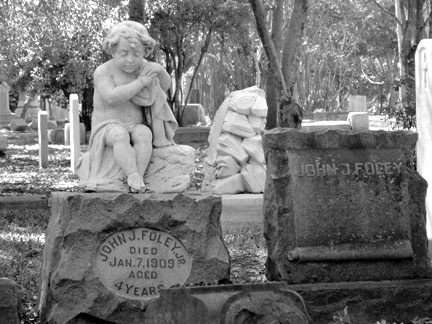 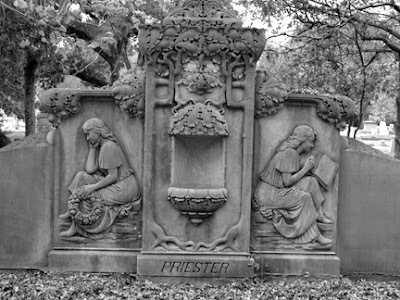 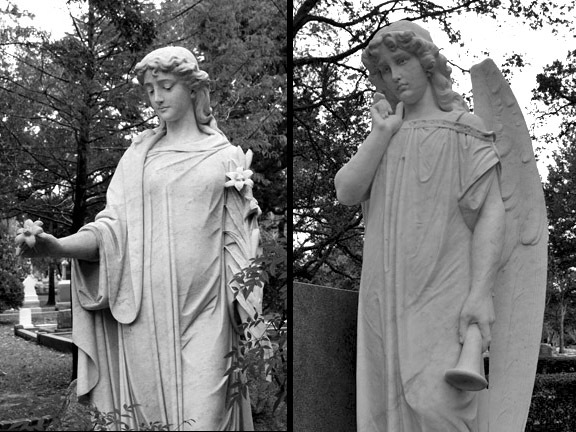 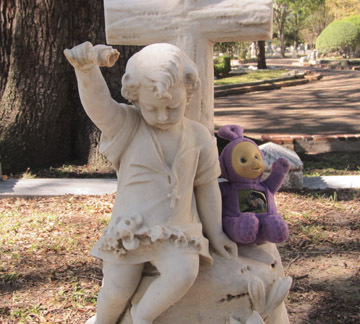 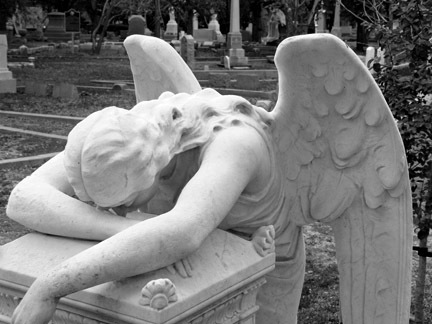 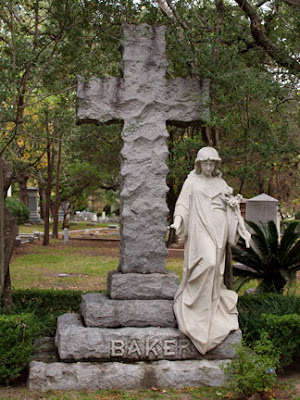 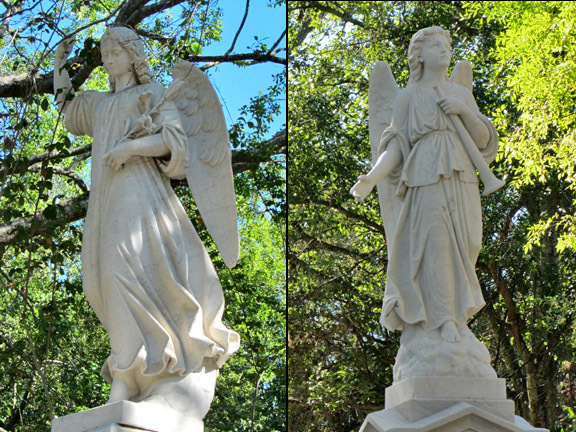 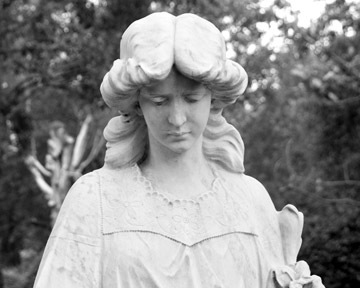 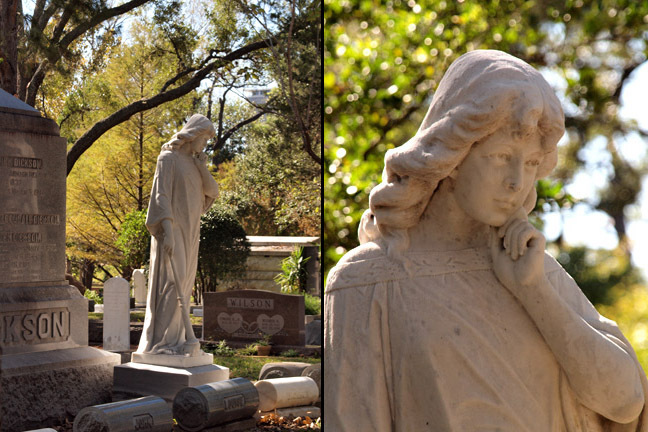 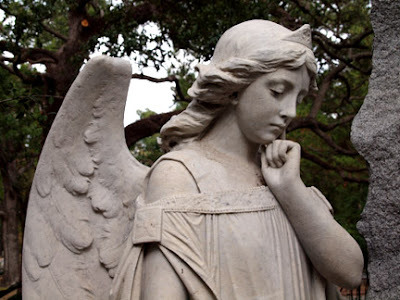 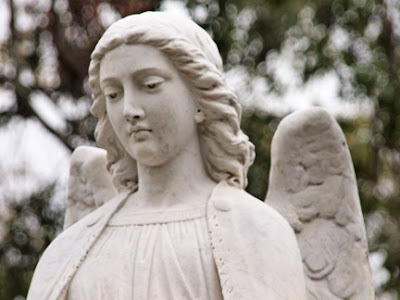 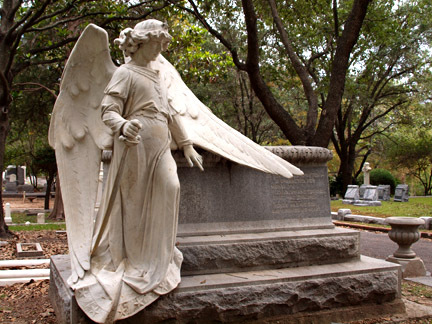 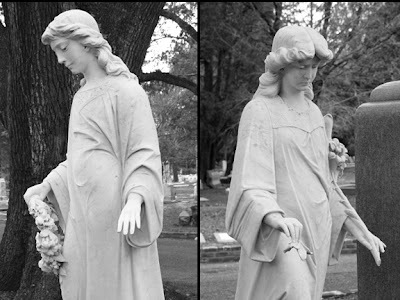 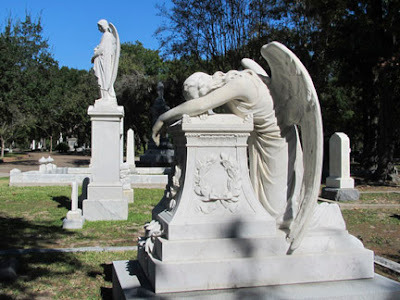 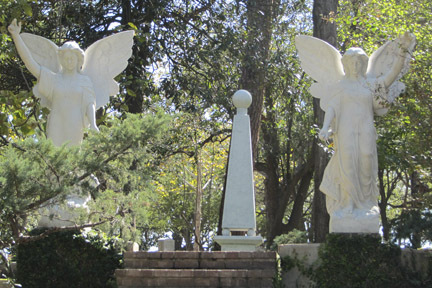 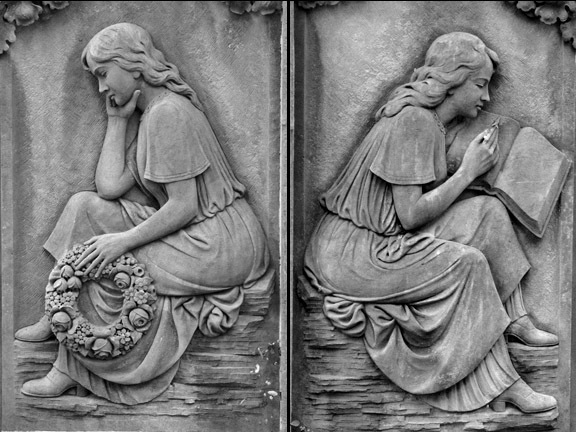 Created by the Houston Cemetery Company in 1871, it was located in a rural area with natural ravines. 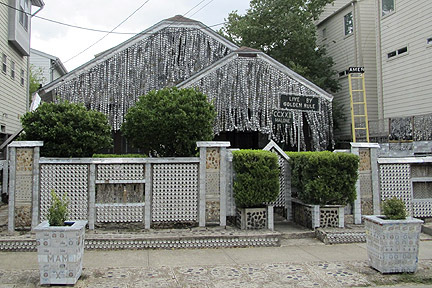 When I was last here, in 1994, it was located in the heart of a poor, run-down, ruff-looking neighborhood. Now it’s surrounded by townhouses and well-kept apartment buildings. 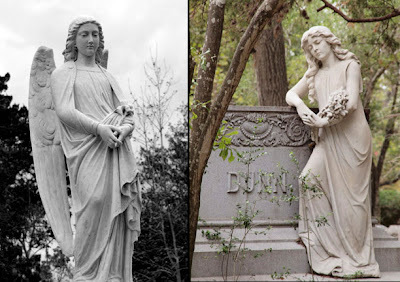 I love these 19th century romantic garden cemeteries which were considered landscaped parks in their era and afforded the general public a pleasant place to spend a Sunday afternoon. 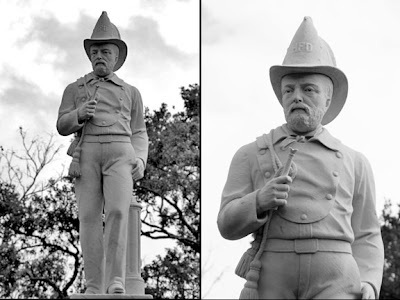 I saw signs of well preformed re-construction on statues that had once been vandalized. 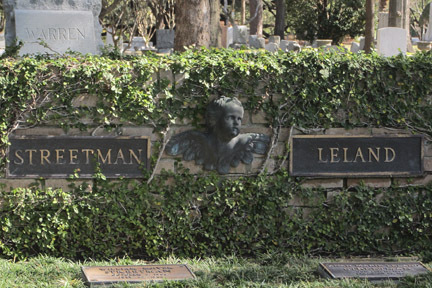 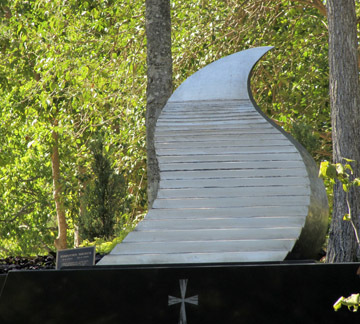 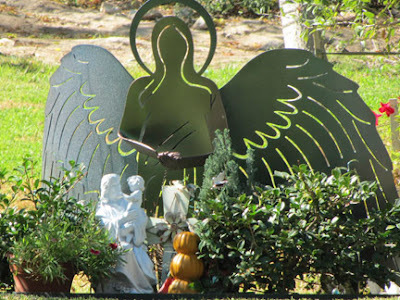 I didn’t know it at the time but, Howard Hughes (Hughes Aircraft) and Gene Tierney (Actress) are buried here. 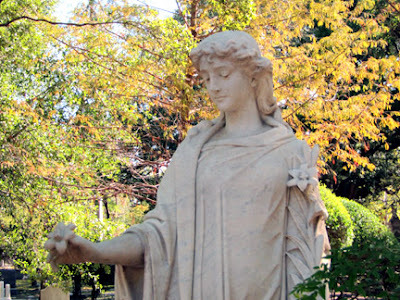 The statue below is the one I remembered the most from my previous visit. 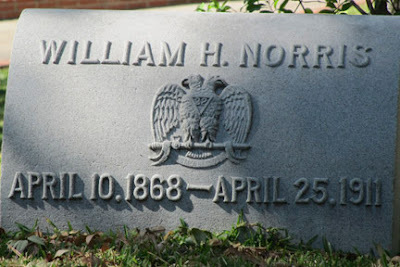 Quinlan, Texas is named after this man and Anna, Texas was named after his daughter. 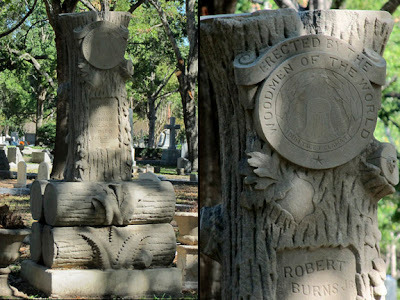 The initials stand for Houston and Texas Central Railway Company. The architect who designed the Houston Cotton Exchange, Board of Trade building plus several courthouses and jails.